Saint Symeon (in the world, the ruler Stephen Nemanja), after capably governing Serbia in piety, wisdom, and justice for many years during the second half of the twelfth century, renounced all rule and earthly glory to become a monk, to struggle in fasting and prayer. Thereafter he went to the Holy Mountain Athos where, together with his son Saint Sabbas (see Jan. 14), he founded the Monastery of Hilandar. After his death, a fragrant and healing myrrh came forth from his holy relics. When Stephen Nemanja put on the monastic habit with the name of Symeon, his wife Anna followed his example, receiving the monastic name of Anastasia; she is commemorated as a Saint on June 21. Loving the angelic life on this earth, thou didst abandon the world and worldly dominion and didst follow Christ by fasting, O Symeon. In an apostolic manner, thou didst guide unto Christ them that loved thee and didst cry: Love ye the Lord even as He hath loved you. 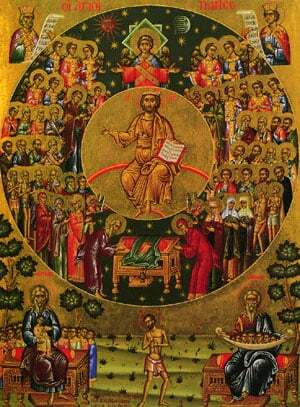 Share the feast of Symeon the Myrrhbearer of Serbia with an icon greeting ecard.